Background and objectives Prior studies have examined long-term outcomes of a single acute kidney injury (AKI) event in hospitalized patients. We examined the effects of AKI episodes during multiple hospitalizations on the risk of chronic kidney disease (CKD) in a cohort with diabetes mellitus (DM). Design, setting, participants, & measurements A total of 4082 diabetics were followed from January 1999 until December 2008. The primary outcome was reaching stage 4 CKD (GFR of <30 ml/min per 1.73 m2). 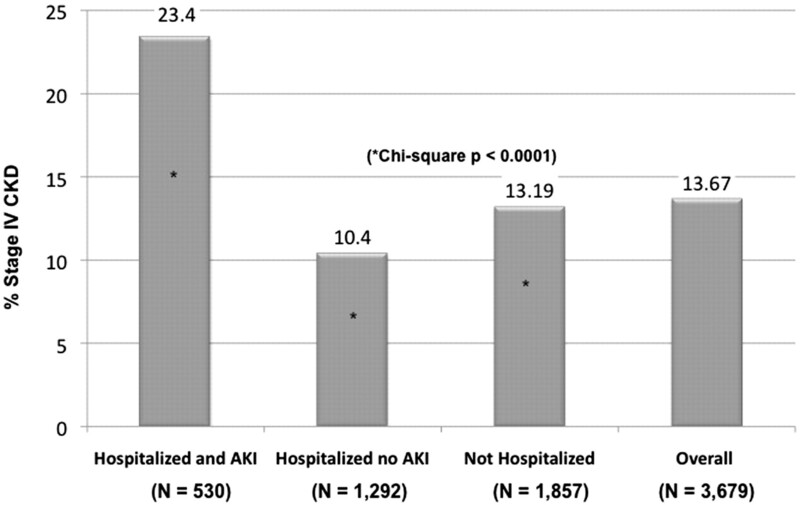 AKI during hospitalization was defined as >0.3 mg/dl or a 1.5-fold increase in creatinine relative to admission. Cox survival models examined the effect of first AKI episode and up to three episodes as time-dependent covariates, on the risk of stage 4 CKD. Covariates included demographic variables, baseline creatinine, and diagnoses of comorbidities including proteinuria. Results Of the 3679 patients who met eligibility criteria (mean age = 61.7 years [SD, 11.2]; mean baseline creatinine = 1.10 mg/dl [SD, 0.3]), 1822 required at least one hospitalization during the time under observation (mean = 61.2 months [SD, 25]). Five hundred thirty of 1822 patients experienced one AKI episode; 157 of 530 experienced ≥2 AKI episodes. In multivariable Cox proportional hazards models, any AKI versus no AKI was a risk factor for stage 4 CKD (hazard ratio [HR], 3.56; 95% confidence interval [CI], 2.76, 4.61); each AKI episode doubled that risk (HR, 2.02; 95% CI, 1.78, 2.30). Conclusions AKI episodes are associated with a cumulative risk for developing advanced CKD in diabetes mellitus, independent of other major risk factors of progression. According to the National Diabetes Fact Sheet (www.cdc.gov), 23.1% of all adults in the United States 60 years and older have diabetes mellitus (DM), and between 1996 and 2007 (www.meps.ahrq.gov), the number of adults treated for diabetes in the United States has doubled (9.1 to 19 million). DM is the single largest contributor to the growing prevalence of chronic kidney disease (CKD); 35% of adults who have diabetes also have CKD (1,2). When associated with kidney disease, diabetes poses a triple threat. It not only leads to ESRD, but also increases the risk for hospitalization, and is one of the major risk factors for development of acute kidney injury (AKI) in hospitalized patients (1,3–6). There is limited information regarding the effect of AKI on the risk of advanced kidney disease in the setting of DM. Specifically, the effect of episodes of AKI on CKD has not been studied, independent of other risk factors such as age, proteinuria, hypertension, or other comorbid conditions. AKI is usually a “hospital-acquired” condition that is associated with high morbidity and mortality during acute care (7–12). AKI also has long-lasting detrimental effects on a patient's health (13). Patients with severe AKI (usually requiring dialysis) are at an increased risk of death or ESRD after hospital discharge (14–17). It should be noted, however, that only a small proportion of AKI patients (<5%) sustain severe AKI or require dialysis, whereas the majority of AKI patients experience milder degrees of kidney injury (11). Although some studies have examined the association between non-dialysis-requiring AKI and the risk of ESRD, these observations are limited because of ICD-9-based determination of AKI and lack information on either baseline or intermediary assessment of renal function (18–20). Furthermore, patients who are discharged after suffering from AKI may face a high risk of rehospitalization and may also sustain repeated episodes of kidney injury. To our knowledge, published studies have not examined the effect of multiple episodes of AKI on advanced CKD. We proposed to examine whether AKI episodes increased the risk of progressive kidney disease in patients with DM, independent of other risk factors. We conducted a longitudinal follow-up of a large sample of patients with DM from a Veterans Affairs (VA) healthcare system over a 10-year period (between 1999 and 2008). We studied 4082 patients with DM who sought ambulatory and in-patient care within a VA healthcare system between January 1, 1999, and December 31, 2004, and followed them until December 31, 2008. The presence of diabetes was determined on the basis of ICD-9-based diagnosis during at least one outpatient clinic encounter. Excluded were 278 patients with <3 outpatient creatinine values, and an additional 125 patients whose estimated GFR was <30 ml/min per 1.73 m2 (estimated by four-variable Modified Diet in Renal Disease equations) (21) at the time of their first creatinine measurement, leaving 3679 patients available for analysis. The analyses were reviewed and approved by the University of Cincinnati institutional review board and the Cincinnati VA research and development committee. Definitions of Outcomes and Covariates. The primary outcome was development of stage 4 CKD during longitudinal follow-up, defined as an outpatient GFR of <30 ml/min per 1.73 m2. Secondary outcome was all-cause mortality. Baseline demographic information, at the time of first available creatinine, included age, gender, and race. Also collected were initial dates of diagnoses (ICD-9-based) of chronic comorbid conditions including hypertension, obesity, ischemic heart disease, congestive heart failure, and peripheral vascular disease. Proteinuria was considered present if a patient had urinary microalbumin concentration of >30 mg/g creatinine, protein-to-creatinine ratio of >0.5, or urinalysis (dipstick) with >100 mg/dl of protein. Comorbid diagnoses and proteinuria determination were considered as time-varying covariates during the time under observation: between baseline creatinine estimation until the primary end point or end of the study, whichever occurred earlier. AKI during each hospitalization was defined as 0.3 mg/dl or a 1.5-fold increase in creatinine relative to the admission creatinine for that hospitalization. AKI severity was classified on the basis of peak creatinine increment relative to the admission into stages I (1.5- to 2-fold creatinine increase), II (>2- to 3-fold creatinine increase), and 3 (>3-fold creatinine increase). The definition of AKI was based on the Acute Kidney Injury Network criteria (22). Information on dialysis requirement could not be accurately ascertained by available extraction methods and hence was not included. By using a previously validated method, we extracted from the inpatient records the primary discharge diagnosis codes to ascertain the most likely diagnoses associated with AKI events (11). A median of 15 (q1, 9; q3, 22) outpatient creatinine values were available for each patient. For the entire cohort, the median follow-up from the first available creatinine to the last eligible creatinine was 62.3 months (q1, 40.3; q3, 87.1). For 199 of 3679 (5.4%) patients, the first available creatinine during the study period fell during an inpatient episode. Of those, only 17 patients suffered AKI during that hospitalization (overall, 0.5%). For patients who experienced an AKI episode during their last acute care hospitalization before meeting the primary end point (n = 58), a median time of 222 days (q1, 82; q3, 369) had elapsed between that hospitalization and the primary end point, ensuring sufficient time for recovery of kidney function. Distributions of categorical variables are expressed as frequencies, and continuous variables are expressed as either mean and SD or medians with interquartile range (q1 or q3) where appropriate. Bivariate comparisons of subjects who did or did not develop stage 4 CKD were made using t tests, chi-squared tests, and Fisher exact tests as appropriate. Overall rates of stage 4 CKD and death were compared across patient groups by chi-squared test. Using all patients who required at least one hospitalization, we conducted multivariable Cox regression analysis to examine the effect on stage 4 CKD of the first inpatient AKI episode versus no AKI as a time-varying covariate. Other covariates included demographic variables, baseline creatinine, and time-varying diagnoses of chronic comorbid conditions (the term “time-varying covariates” indicates that our models did more than include baseline, static risk factors). In a separate Cox survival model, we examined the effect of up to three AKI episodes (accrued over the follow-up period) as a time-varying covariate on stage 4 CKD; other covariates included were similar to those from the initial model. We tested interaction between baseline creatinine level and AKI for effects on primary end point. Multivariable models were constructed by applying backwards elimination to a set of candidate predictors until all predictors remaining had P values less than 0.05, adjusted for other predictors left in the model. The relationships between baseline creatinine and the outcomes were examined to ensure a lack of gross nonlinearity, as was the interaction between baseline renal function and AKI. The proportional hazards assumptions for the AKI variables (any AKI multiplied by time interaction or up to three episodes of AKI) were tested examining the AKI* time interaction. In each case, the interaction term was NS, thus supporting the proportional hazards assumption. The risk estimates were expressed as hazard ratios (HRs) and 95% confidence intervals (95% CIs). The sample was 97% male, with a mean age of 61.7 years (SD, 11.19) and mean baseline creatinine of 1.10 mg/dl. Mean time under observation for the cohort was 61.2 months (SD, 25). 1822 of 3679 (49.5%) patients required one or more hospitalizations, and of those requiring hospitalization 29% (530 of 1822) experienced at least one episode of AKI. There were 805 episodes of AKI in 530 patients, 70% of patients (373 of 530) experienced only one episode, and 30% (157 of 530) experienced ≥2 AKI episodes. The AKI episodes were generally mild in severity (88% of episodes were AKI stage I, and 12% were AKI stage 2 or 3). The mean baseline creatinine in patients with or without AKI was 1.06 and 1.12 mg/dl, respectively. Among the common admission diagnoses associated with AKI, cardiovascular disorders constituted 40% of AKI patients. Stage 4 CKD occurred in 13.6% (503 of 3679) of patients (Figure 1). The frequency was 10.4% in hospitalized patients who did not develop AKI, compared with 23.4% in hospitalized patients who developed AKI (P < 0.0001). Table 1 shows a comparison of patient characteristics across those who reached the primary end point versus those who did not. Patients reaching stage 4 CKD were older and had a lower baseline level of GFR. Frequency of reaching stage 4 chronic kidney disease (CKD) by patient groups. 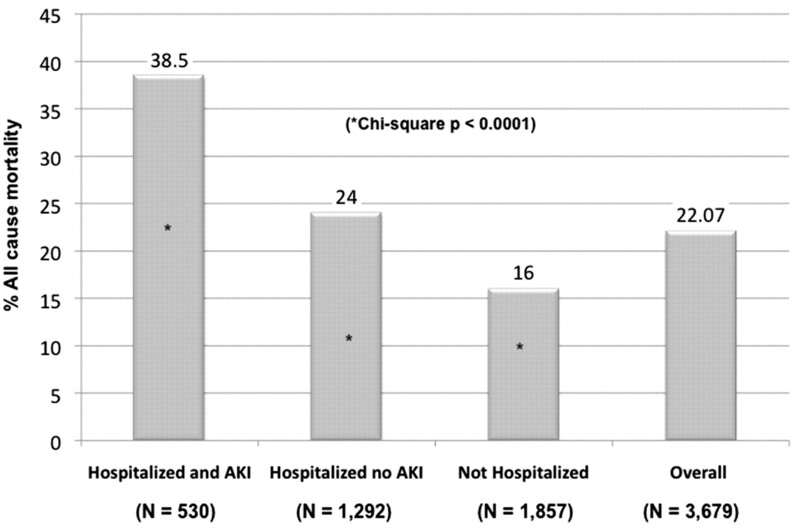 In a multivariable Cox proportional hazards model, AKI during hospitalization was a risk factor for stage 4 CKD (HR, 3.56; 95% CI, 2.76, 4.61) compared with those without AKI. Additional risk factors included higher baseline level of creatinine, presence of proteinuria, presence of hypertension, and female gender (Table 2). Figure 2A represents predicted survival (to stage 4 CKD) curves for patients with and without AKI, censored for death and any other loss to follow-up, adjusted for significant covariates. In a separate Cox model, which examined the effect of multiple AKI episodes (counting up to three episodes), each episode doubled the risk of stage 4 CKD (HR, 2.02; 95% CI, 1.78, 2.30), independent of other covariates (Table 2). Figure 2B represents adjusted survival (to stage 4 CKD) for patients without AKI and those with multiple episodes of AKI, censored for death and any other loss to follow-up. 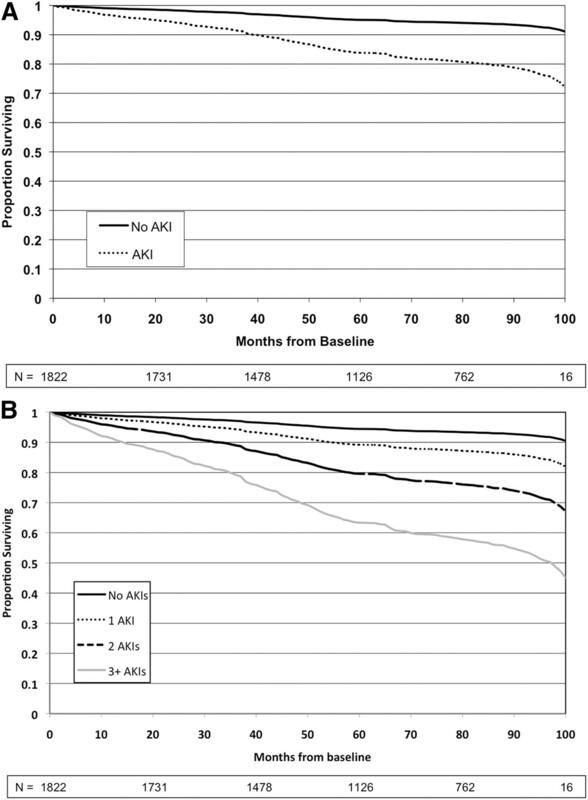 (A) Survival to stage 4 CKD in no AKI versus AKI groups. (B) Survival to stage 4 CKD in no AKI versus multiple AKI episode group. CKD, chronic kidney disease; AKI, acute kidney injury. There was a significant interaction between baseline serum creatinine level and AKI episodes in the Cox model predictions of the primary end point (P = 0.002). Figure 3 shows the effect of AKI versus no AKI on the primary end point, stratified into three groups of baseline GFR; of note, the magnitude of hazards associated with AKI were greater in patients with relatively preserved baseline renal function. Table 3 shows that AKI episodes increased the risk of reaching primary end point across all categories of baseline levels of GFR. Survival to stage 4 chronic kidney disease (CKD) in AKI versus no AKI groups, by strata of baseline level of estimated GFR. CKD, chronic kidney disease; AKI, acute kidney injury. Figure 4 shows all-cause mortality during the time under observation for different patient groups. Overall mortality was 22% for the entire cohort. It was 24% in those who were hospitalized but did not develop AKI and 38% in patients who were hospitalized and experienced at least one episode of AKI (P < 0.0001). Frequency of all-cause mortality by patient groups. In subgroup and sensitivity analyses in 473 AKI patients (90% of AKI patients), there were multiple creatinine values available (median, 7) between the baseline determination and the date of the first AKI episode. The median time between the baseline creatinine and first AKI episode was 30 months. We constructed new survival models with any versus no AKI and multiple episodes of AKI by replacing baseline creatinine values (mean, 1.12 mg/dl; SD, 0.29) with those preceding and closest to the first AKI episode (mean, 1.22 mg/dl; SD, 0.28). The results from these models were essentially similar to the original models. We also conducted sensitivity analysis by changing the threshold of change in creatinine level used to define AKI. The first set of analyses used a definition of AKI that required a ≥1.5 times increase in creatinine during hospitalization, and the second set of analyses defined AKI as ≥2 times or greater increase in creatinine during hospitalization. Regardless of the threshold of elevation used to define AKI episode, the results were similar to the original models. Diabetes is the most important contributor to the growing burden of ESRD, and patients with diabetes are also at a greater risk of requiring hospitalizations and experiencing AKI. Our study reports a novel finding that, in the setting of DM, AKI increases the risk of advanced CKD by over three-fold, independent of other risk factors of progression. Each episode of AKI has a cumulative dose-response association and doubles the risk of reaching stage 4 CKD. Recent reports have demonstrated a link between severe AKI and ESRD. In a case-control study, the incidence of ESRD per 100 person-years was three-fold higher for patients (AKI requiring dialysis) versus controls (no AKI) (16). This study did not report creatinine levels either before the AKI episode or after discharge. Hsu et al. (15) showed that 49% of CKD patients who sustained severe AKI reached ESRD status within 30 days after discharge, compared with only 1.5% of CKD patients without severe AKI. Similar associations existed in patients with baseline estimated GFR >45 ml/min per 1.73 m2, where severe AKI requiring dialysis was associated with a 28-fold increase in the risk of stage 4 or 5 CKD (14). Our observations are novel and contrasting from these reports, in that we specifically studied a cohort of patients with DM to ensure a relatively consistent underlying natural history of kidney disease. Additionally, we extracted serial creatinine measurements during both inpatient and outpatient care over a 10-year period. This enabled us to study the kidney disease progression in those patients who experienced milder degrees of AKI during hospitalization, as well as those who did not require hospitalization. We also examined the effect of AKI and other major risk factors of CKD progression in diabetics (including age, hypertension, and proteinuria). Most importantly, the study shows that repeated episodes of AKI occur in about one third of AKI patients who survive initial hospitalization, and each AKI episode doubled the risk of advanced CKD. Few other studies have examined the effect of nondialysis requiring AKI on long-term renal outcomes. Newsome et al. (18) examined a graded association between creatinine increment during acute care and a distant risk of ESRD in Medicare discharges after acute myocardial infarction. Patients were distributed in quartiles on the basis of creatinine increment during acute care (0.1, 0.2, 0.3 to 0.5, and 0.6 to 3.0 mg/dl). Compared with those without any creatinine increase, patients in higher quartiles had increased hazards for ESRD. This analysis lacked the information on baseline or follow-up measurements of creatinine. Two recent studies derived from the Veterans Health Administration patient population confirm that there is an independent association between degree of severity of kidney injury and future risk of CKD, but these studies did not assess the effect of multiple episodes of AKI (23,24). Other studies that have examined nondialysis requiring AKI as a risk factor for ESRD have used ICD-9-based diagnosis codes to determine AKI or CKD status, which is known to have low sensitivity (<20%) (19,20). We used patient-level data to examine the association between multiple AKI episodes and CKD. We also conducted sensitivity analyses to confirm that the threshold used to define AKI did not qualitatively affect this association. Our study shows that there was a significant interaction between the level of baseline creatinine and AKI episodes. AKI was a significant predictor of stage 4 CKD at all levels of baseline renal function; the magnitude of hazards associated with stage 4 CKD was the highest in patients with relatively preserved renal function. These data suggest that even mild AKI in diabetic patients with relatively preserved renal function should be viewed as a serious event. Reconciling the experimental evidence with this epidemiologic observation requires further confirmation. Future studies involving tissue-specific biomarkers may assist in discriminating between the long-term consequences of reversible/functional changes in renal perfusion versus evidence of parenchymal injury. There are limitations to this analysis. Although a single-center observation, we were able follow a large sample of veterans who are likely to seek both in-patient and outpatient care to conduct an adequately powered analysis. This observational study does not establish causality. It is possible that in a small subset of patients with baseline renal dysfunction, the CKD status itself was a risk factor for AKI, thus raising the possibility of reverse causality between AKI and CKD. It should be noted, however, that a large proportion of our patients had normal GFR at baseline. Another limitation is the introduction of ascertainment bias as a result of the retrospective design. Patients who are sicker are likely to have more serum creatinine values available. We believe that the availability of long-term follow-up and the unique structure of the VA healthcare system, where every enrolled veteran is expected to have a primary care physician and have scheduled health screening and wellness visits, would minimize this potential bias. Over half of the patients with DM require one or more hospitalizations during a long-term follow-up. Of those who are discharged after an AKI episode, 30% will experience another AKI episode. AKI increases the risk of advanced CKD in a diabetic patient independent of other major risk factors of kidney disease progression, and each episode of AKI doubles this risk. New strategies are needed to prevent, treat, or ameliorate AKI during hospitalization to help curb the growing burden of ESRD in patients with DM. The study was supported by career development award (to C.V.T. and T.L.) from the Veterans Health Administration. The co-authors report no competing financial interests. See related editorial, “Acute Kidney Injury and Chronic Kidney Disease: A Work in Progress,” on pages 2555–2557.